Buy now on Amazon to support my blog – only £0.99! 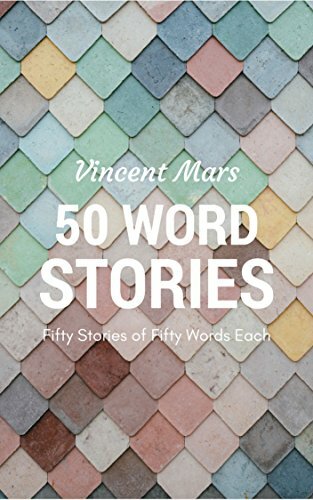 Concise, intriguing, surprising, the fifty 50-word stories in this collection can be read quickly and with ease, at home or on the go. Why 50 words? Why not 49 or 51 or 50,000? Well, why not? A good story can be told in just a few words. Whether you’re a short story lover or just want to try a new flavor of fiction, these stories will surprise you in many ways. Read them now! I love it. Good work Vincent. Your book is amazing. It is a testament to the adage, “eloquent in its brevity”. I listed this book of GoodReads. It is honestly one of the most touching collections I have ever read. I’ve only started reading ( I’m locked in the Boringness Hole…some call it work) just to say I already really enjoyed the few brief, little gems I just read! Will print the pages and bound them together for my own safe keeping and when I have little children I will read it to them! There’s something addictive and inspiring about your 50 word stories. Having found them, I am now hooked, and I love building narratives around them. Yay! That’s so good to hear. Makes my heart tingle. Vincent! You’re the man! Haha. This is so epic! I’ll introduce this to my friends now…so amazing. Thanks for this free download! All the best! Superb! That’s just so wow! I’m honored. Thanks! I enjoyed reading your 50 word stories and I have started writing 50 words of my own. Thank you for the amazing inspiration I’ve receieved just reading your blogs. I must say, yours is one of my top favorite blogs. Hats off to you, even though I don’t wear any. Much too young to be a sir! I have just finished reading your 50 Tales … and have it on my Iphone as well so that I can refer to it again and again even if I’m not at home. I simply adore the unadorned beauty of these stories. They say “a picture is worth a thousand words”, and in this case, each of your short short stories is worth a thousand words or more. I only wish there was a way to get the book in a suitably nice binding so that I can enjoy it a way you can’t by reading on a computer. You know, sort of in the way that writing by hand writing is different from writing with a typewriter … reading a book you can touch, and hold, an look at on the table is different from reading on an electronic screen. dude ur work is so great! i get so excited when i see you have a new post.!!! Downloaded it and enjoyed it thoroughly. Wonderful read, wrote a post on it..This was my first introduction to 50 word tales. You are very gifted and I am keen to follow you on your sojourn, learn from you and share you with others. Reading this book today is an invisible gift. Thank you. Good luck with your writing. Many thanks for visiting my blog. Come back on Friday for a new flash fiction story! What an amazing book. Your snapshots of moments create a wealth of emotions, images and questions. Even in the restricted frame of 50 words I engaged in the stories and conected with the characters. Each Story left me wanting more. What a gift and talent you have! loved those 50 stores difficult to believe you are so young, a young man with talent. I’ve written better ones since then. I hope to publish a bigger book soon. When will you publish Oliver and Katherine? I just bought your book. So good! I like the way you work clever plot twists into so few words. Enjoyable read. I am so happy to hear that. May I ask whether there is any story you like in particular? I think I liked the funny ones the most. For example, #3 made me laugh. I thought #17 and #31 were funny too… I liked #6 and 16 a lot also because they were heartwarming. 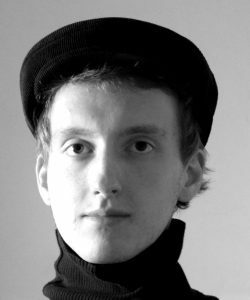 I found your website and I admire your succinct turn of phrase – the 10 tips for writers piece has me wanting to read and reread – almost to stage that I do better than have a paraphrased recall of the 10 points. You nailed one concept for me – that of story – I have many stories still to write – as there are species in botany – this greenery is part of our culture – plants, fungi, liverworts, lichens growing on various trees that one can go for a walk to and see – I never really understood what was a story – and I will read more with interest. As to me, I gave up English at 14 in school, did well at Maths, Physics and Applied Maths, but never pursued it at college – There I read Pharmacy and did botany as a hobby – I have worked as a botanist – but have had my scientific vision stymied by my personality clash with my boss – and am now reengaging with writing – defining myself as a writer 3 years ago was the best move I made – the lichenfoxie blog shows what I get exercised about – I am enthusiastic about latin as a botanical language aide for describing plants their shape and form, as with watercolour painting as a calmer way of illustrating (which I have to work hard to allow myself to start every so often) and close up photography (40mm field of view) for species recognition of parts of various plants – I like your style – elegant – hat wearing 9 out of 10, formal costume for a courtier of the Roumanian court – and I would like you to read one of my longer poems – here is the link https://lichenfoxie.wordpress.com/2014/10/30/caribbean-literary-salon-blog-v/ – there is a rhythm to writing – and that is what your prose captures ! I hope you like – see the diversity ! Where’s your other fiction books like Oliver Colors? I enjoy reading your blog a lot. But unfortunately, I can’t buy your book on Amazon since it isn’t available in the US kindle store. Is there any other way that I can get it? Hi Sanjana . It should become available soon. Can you give me your email address? Hi Vincent, Just wanted to let you know that I was able to buy the book now. Excited to read it!